Thiru.A.M.Raman, I.A.S., (Retd), Advisor Saraswathi Educational and Helath Trust., as a retired Civil servant, has over 34 years of professional experience in Government Service in various capacities in General Administration, Academic Administration, Management of Industrial Establishments, Discharging regulatory functions and Quasi Judicial responsibilities. He has a vast experience in Academic Administration and he has handled files relating to the Management of various Universities in Tamil Nadu in the Office of the Governor of the State (Chancellor of all Universities) in the capacity of Deputy Secretary to Governor between 1983 and 1986. During this period he had exposure to the policy making issues relating to Educational matters at the State Level. As Collector of Coimbatore District which was identified as one of the Technology Mission districts in the Country to introduce Total Literacy Programme as perceived by Sam Pitroda, adopted various techniques and methods in spreading the mass literacy programme throughout the district. During this tenure in the district he participated in several meetings, seminars, symposia etc., organized by the National Literacy Mission Authority at Delhi and elsewhere. As leader of the mission several methods were identified and implemented which received all round appreciation from the authorities. 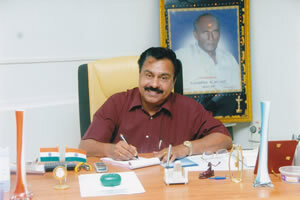 Between 1991 – 1993, in the capacity as the Director of Adi Dravidar and Tribal Welfare Department, he managed, controlled and monitored the affairs of around 1500 schools including 200 schools in Tribal areas functioning under the control of the Department of Adi Dravidar and Tribal Welfare, Government of Tamil Nadu. During this period the over all performance and the results of the students in High and Higher Secondary Schools improved remarkably resulting in more enrolment of SC Students in the school and advancement in Education. As Secretary to Chief Minister, he had handled, all Policy Matters relating to Primary Education, Collegiate Education, Technical Education, Health Education and University Education. During this period several important Policy Issues relating to Establishment of Engineering Colleges, Single Window Systems of Admission for Engineering and Medical Colleges, Fee Fixation for Professional Colleges etc. were formulated and introduced. As the Vice Chairman of Science City, an autonomous organization established by the Government of Tamil Nadu,he was in charge of organizing various Science and Technology related programmes that would be useful to the society. He was instrumental in designing and implementing the State Level Science Quiz Programme and organized it throughout the state for the benefit of the school students with the main objective of improving the scientific knowledge base of the students. In addition to the above assignments, in the educational arena, he also held the following positions in Government of Tamil Nadu viz., Managing Director of Cooperative Spinning Mills, (Madurai), Managing Director South India Cooperative Spinning Mills, (Thirunelveli), Managing Director of Tamil Nadu Textile Corporation, Deputy Secretary in Charge of Major Industries, Executive Director, Tamil Nadu Industrial Development Corporation (TIDCO). It is really a pride & prestige to our Institution, to have a personality with such a vast experience, both, in “Administrative & Educational Arena”, to be the Educational Advisor. The society, the student community and the Institution are the beneficiaries of his experience.